I love close, frame-filling wildlife photos, but I also love wildlife photos that show animals in their environment. Getting close enough to fill the frame with an animal is often quite challenging, but I often find environmental images even more challenging to obtain. Another thing I love is a challenge and the environmental wildlife portrait challenge one was one I took on during a recent photo trip to the Big Meadows area of Shenandoah National Park. Location selection is a big part of environmental wildlife portraits. Basically, you need to photograph wildlife in an environment that invites the type of photos you desire. I would not describe the scenery of all locations that hold wildlife as especially photo-worthy and the tighter-framed option works better in these less-desirable landscapes. Just as important as a photogenic landscape is that wildlife, or more specifically, wildlife that interests you, is in the location. Location selection resources have never been more readily available. Simply search your favorite image sharing site for the subject that has your interest. Then determine where that image was captured. With the location selection made, timing the photography in that location can be done. If you want fall-colored leaves, there will be a week or two out of the year that needs to be targeted. If baby animals are on your list, there will be an ideal time, likely in late spring. 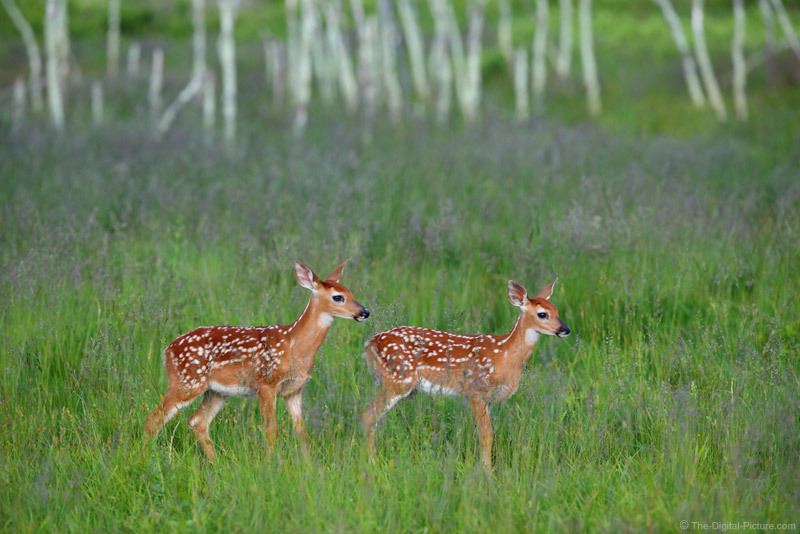 For the example I share here, I knew that early June was a good time to photograph fawns and I knew that Big Meadows in the heart of Shenandoah National Park was a great place to find them. SNP scenery is very nice, though as with most locations, it can be challenging. Within the chosen location, wildlife cannot be controlled (unless baiting, calling, etc. ), so a photographer must work with the animals wherever they decide to be. Learning wildlife behavior goes a long way to set up the ideal shot, but wildlife is generally unpredictable. While locating wildlife, visualizing ideal shots will keep your mind focused on upcoming opportunities, including those that may present themselves at a later time. The key for this white-tailed deer fawn image, in addition to being in a good location at the right time of the year, was thinking ahead. The deer were moving in a general direction and I knew that the white tree trunks in front of ferns and fronted with tall grasses were coming up on their route. The shorter green grass foreground would be ideal and I surmised that these fawns and their mother may pass through this location. I was partly right. The mother went slightly off-angle, but the fawns cooperated briefly by walking, broadside, in line and both within the plane of sharp focus, right into the scene I visualized. I was ready. Under 10 seconds. That is how much time the fawns spent in my scene. That is both extremely short and very long. I had very few other decent opportunities that lasted longer, but 9 seconds is not much time to capture an image of wildlife in motion even when standing (head and ear angles were constantly changing). This was one of the last frames captured before they turned different directions and leaped off to explore somewhere new. The 1D X Mark II was in manual exposure mode with Auto ISO selected. The light levels were changing rapidly due to clouds and both deer and grass are kind to autoexposure, making Auto ISO a great choice. The adorable fawns were running/leaping/frolicking constantly, so I was using a 1/1600 shutter speed most of time. It is usually better to have more noise due to a high ISO setting than to have a motion-blurred subject. With the fawns slowing down and with their distance being greater than usual (their movement was crossing individual sensor pixels at a slower rate), I quickly rolled the shutter speed down to 1/800. Auto ISO took care of the exposure adjustment, immediately selecting a lower noise level ISO 1000. High speed burst mode with Case 1 AI Servo AF and a single AF point placed on the lead fawn worked ideally. The Canon EOS-1D X Mark II and Canon EF 200-400mm f/4L IS USM Lens combo performed impressively on the entire trip. While this lens has many benefits (including incredible sharpness), being able to zoom to ideally compose a scene, especially one with multiple animals, is a big one. Though this image does not take in a wide, grand landscape, it includes enough surroundings to qualify for at least my own definition of environmental. At 362mm, this lens could be set to an even much wider angle. However, I didn't feel that additional surroundings were going to be positive additions to the image. I had enough angle of view at the chosen focal length. I'll talk more about the 1D X II's amazing frame rate and why it was so important for this location in another post, but ... I made full use of the 14 fps. Just to clarify, there really are two different fawns in this picture. This particular frame taken from a burst captured both in nearly identical positions. Upon a quick glance, my daughter suggested that I may have clone stamped the second deer into the image. I assure you that was not the case – there really were two fawns there. The slightly different leg positions are the biggest clue. The 1D X II's AF system performed especially well in the tall grasses the fawns were commonly found in and was ready when the fawns started leaping and playing. Note that I used a monopod exclusively for support on this trip. While a tripod provides better support, a monopod is faster to use. With only one leg to retract or extend and with no leg angles to set, I could quickly move into positions and set up, a key to getting many of the images I captured on this trip. A monopod also means less weight to carry around. The wildlife I was shooting required shutter speeds fast enough to avoid motion blur, especially with the support of the monopod. Be ready to take advantage of all wildlife photo ops made available to you. Even if focused on the environmental images, take the tighter-framed images when availed to you. Wildlife photography is extremely challenging and no opportunity should be passed on. Having a mix of subject framing will make a portfolio or gallery appear more complete.